The 85' Azimut Ultimate Motor Yacht SUN ADVENTURES is a ship-like motor yacht personifying discernment, distinction and plain good taste. It is a boat upon which one can entertain, and cruise comfortably. 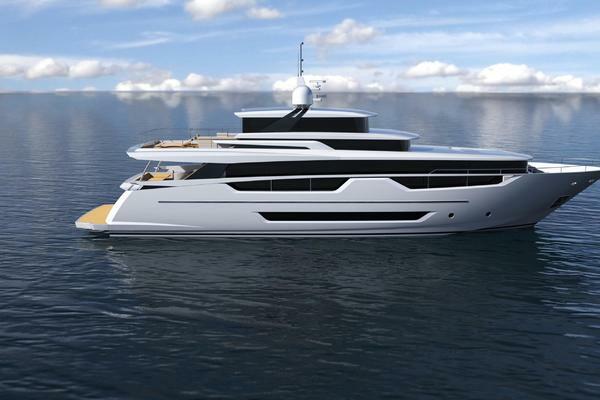 The deep-vee hull with hard chines and 17° of deadrise was designed by Stefano Righini. Plush carpets, varnished cherry, burlwood and marble flow throughout a galley with Miele appliances, down companionways to cabins with personal sound systems and en suites with bidets and full-size showers, up to a flybridge with entertainment spaces and barbecue, and aft crew quarters complete with a full-sized laundry. The Azimut 85 distinguishes itself in a number of ways. This Italian-made beauty cruises like silk at displacement speeds, trimming is precise without transom drag or a down-hooked bow laying low in the water. Come fair weather or foul, the Azimut 85 will get you through stormy seas in first-class comfort. The boat provides good vision from its open-air flybridge - with an enclosed hard top for shade and protection from the elements. Below is a fully equipped pilot house helm station with comfortable seating and massive glass windscreen. Fitted with twin V12 1350hp MTU engines, this 85-footer responds more like a sports cruiser than a mini-ship. Throttle down and the 66,000kg boat does a stunning 27-29 knots, with cruising speeds of 24-25 knots. Because the Azimut has been designed with a view to outdoor living as well as inside escapes, you gain a sense of freedom the moment you step aboard. The full-length bulwarks are again more ship-like than flashy, and protected from the bridge overhang which also shades the cockpit. In true Italian style, there's a body-beautiful sunpad built into the bow, large amounts of clear deck space, and volumes of storage for lines and fenders hidden under a discreet hatch. There is an integrated anchoring system, loads of stainless hardware, including hydraulic winches that reel in the aft mooring lines. The oval table fronting the semi-circular lounge can seat six for outdoor gatherings and there is a formal indoor dining room with hand-turned timber dining table. From the cockpit, a push-button control pad lifts the transom door with garage space for toys and tender. Light, spacious and welcoming, the main saloon of the Azimut 85 Ultimate is the apogee of understated elegance. The 85 Ultimate has a comfortable rounded sofa aside the modern pilot station. In addition, the elegance of the owner's stateroom is perfectly blended with an excellent use of space, while mirrors and light colors enhance the spaciousness of the owner's sumptuous bathroom. The comfortable VIP cabin is located in the bow of the yacht. The Azimut 85 features an elegant and tasteful interior, there is both ample headroom and floor space. With the doors pulled open you could flow into the cockpit for cocktails, or go up top for al fresco dining. Inside, the formal saloon is flanked by Azimut's signature elliptical windows and curvaceous lounges upholstered in leather. Plush carpet and cream headliners and curtains add to the understated elegance. At night the ambience comes from indirect halogen down-lighting and a central ceiling feature containing string lights. All vertical surfaces are ruby-hued cherrywood, with the horizontals in burlwood, including the dining table and six chairs on the starboard side. Opposite, the galley is hidden behind a wooden-slat screen. The galley contains marble bench tops, with chrome accents and gilt edging. There are twin circular stainless sinks so you can stack plates and scrub pots, a single-action tap, electric Miele appliances including dishwasher and family-sized oven. For a more private setting, you might use the leather lounge and compact dinette up front, alongside the internal space-age helm station with its impressive pneumatic chair. The open-plan layout allows you to see right through to the helm from the salon, yet it's a private space perfect for an owner and partner to dine while underway. The Azimut Ultimate motor yacht boasts an A-class Master Suite with built-ins, en suite bath with his and her features. 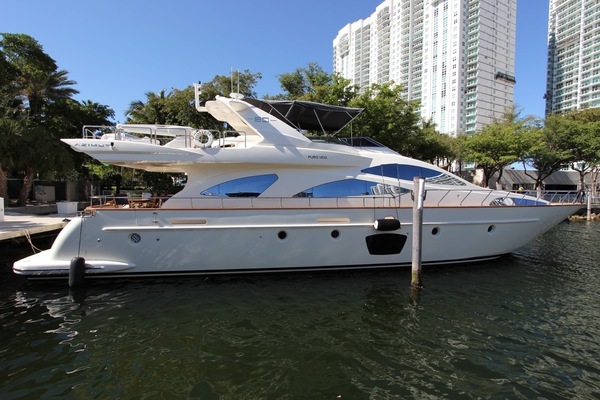 The Azimut 85 provides four double guest cabins, all with the same Ultimate style. Below decks and amidships, the master suite featuring a recurring theme from the salon: cherrywood and sheets of burlwood enlivened by halogen down-lights and a central ceiling feature with strip lighting. The wardrobe lockers are walk-in, there's a settee and powder station, and a king-sized island bed with inner-spring. The master bathroom is another world again, with marble bench tops and swirling marble floors, chrome and gilt-edged taps, a bidet, oversize throne, and shower with a series of special body sprays. An entertainment system, individual controls for the air conditioning and controls for piped music are all set in wood. Two steps forward are the twin guest cabins with single berths, port windows and en suite heads with built-in soap dishes and toothbrush holders made from a stylish frosted glass. The VIP guest cabin is in the bow. It has a king-sized island bed, settee, make-up station, and his and hers hanging wardrobes. Back on the outer deck, there is a companionway leading down to the huge engine room with ample headroom. Nearby, the crew quarters can accommodate the entire team, with private heads and a laundry room. Built from solid 'glass below the waterline and with foam-sandwich above, the Azimut 85 feels solid and sea-worthy on the water. There is virtually no discernible transition from displacement to planing speeds, and a massive amount of torque thanks to five-blade Rolla props and the new Series 2000, 1350 hp MTUs - with computer monitoring and LCD displays. With electronic controls and a 35hp hydraulic bow-thruster, the boat maneuvers easily. 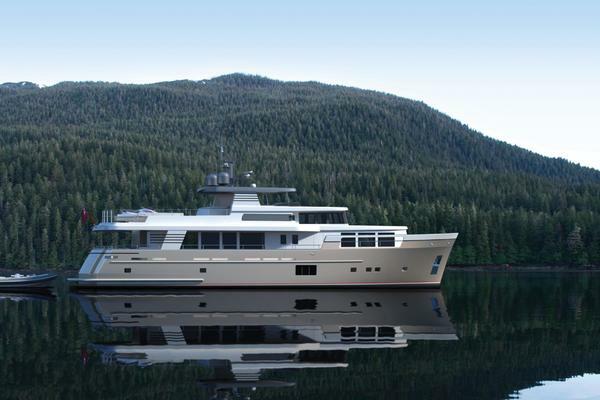 Galley is separate from salon and pilothouse by built-in furniture w/sliding panels to close off completely. Vinylester resin is for the first coats of the lamination below the waterline. Isophtalic resin is used for all the stages of the hand laid up lamination process. High quality PVC is used for main deck and superstructure lamination with sandwich core. Extreme aft and bow bulkhead are in fiberglass with sandwich core. All other internal bulkheads are built with advanced composite.